Flow-controlled, open-rimmed training cups that help children transition from sippy cups to open cups. The Reflo Smart Cup™ is a revolutionary new concept in training cups. It's a great transitional tool for your children to learn to drink from an open cup. Also great for others who have difficulty drinking from a cup and need a little assistance controlling the flow of liquid. No buttons or other complicated mechanisms to operate. As easy as drinking from any ordinary cup without the worry of big spills due to the patent-pending Reflo insert that controls the flow of beverage anywhere along the cup's rim and at virtually any angle. BPA-free, phthalate-free and dishwasher safe, the cup is designed for safety and hygiene with no moving parts to trap dirt and germs. Recommended for all ages as a smart alternative to "sippy cups" which have been associated with dental and speech problems. The Reflo Smart Cup is the safe, smart way to learn to drink from a regular cup. 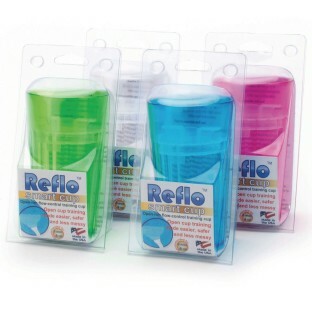 Each unit contains 48 cups (12 each of blue, clear, green and red-violet), 48 Reflo inserts and 48 sets of instructions. Made in the USA and winner of the 2014 Family Choice Award.